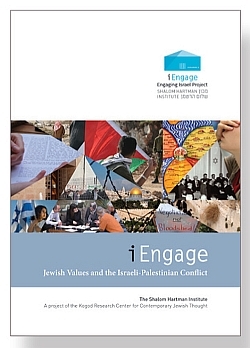 The Engaging Israel: Foundations for a New Relationship video lecture series, now in use by scores of synagogues and community groups across North America and the United Kingdon, focuses on the critical questions facing world Jewry with regard to Israel. Join the many communities and thousands of concerned individuals in establishing a new narrative of Jewish values and ideas that encourages Jews to engage with Israel and to act on a vision of what they believe can and ought to shape the modern Jewish nation and its policies. The Hartman Institute video lecture series brings the excellence of Hartman scholarship directly to your community. Providing relevant, contemporary approaches to the most urgent challenges facing the Jewish people today, the lecture series enriches the adult learning experience for you and your congregation. What will I receive when I order the Engaging Israel Video Lecture Series? Each unit includes a 25-minute lecture by Rabbi Dr. Donniel Hartman, followed by a 25-minute dialogue between Rabbi Hartman and members of the Engaging Israel Research Team or other subject-matter experts. The dialogues explore some of the complexities of the issues raised in the lectures. (Please note, Unit 6 includes just a dialogue, no frontal lecture.) View lecture descriptions. The same lectures and dialogues can also be accessed via Hartman Online, our streaming video platform. The source book includes all of the textual sources that are referred to in the lectures and additional relevant sources that you may wish to teach before or after the video lecture. Background readings that will enrich class discussion for each unit are located online, with restricted access for course participants and leaders. Each order includes one source book for the leader of the course. You may add more source books to your cart at the same time as your original order, or you may order additional source books later on once you know approximately how many course participants to expect. Source books cost $20 each including regular shipping (expedited shipping is available at the customer's expense). Additional readings are available online only. Find them here. The Interactive Hevruta Training Course on USB card includes video explanations by Rabbi Donniel Hartman for each of the 151 texts in the source book, highlighting the particular relevance of that text to the unit in which it is placed. The instructions for how to use this guide include directions for adding your own personal written notes alongside the explanatory videos. These videos are also available on Hartman Online. This booklet includes suggested questions for guiding hevruta study and group discussion, and other suggestions on how to structure and teach the course. If you have questions about whether the Engaging Israel video lecture series is right for your community, or if you have additional questions on how to use iEngage Project material, please contact Rabbi Lauren Berkun.